North Africa had long been a target for European imperial plans, and in the case of Morocco it was France and Spain that established a presence in the country. In 1904 these two countries agreed ‘zones of influence’, and these became formal protectorates (little short of possessions) by agreement later on. The northern coast of Morocco became a Spanish protectorate, including the Rif Mountains, and the Spanish began exploiting the rich resources here without compensating the locals. The local tribes, who cared little for control from any outsiders, confronted these new interlopers, and the Spanish Army intervened, but resentment continued and in 1920 open warfare began with the Rifs under the charismatic leadership of Abd el-Krim. Initially the Rifians were very successful, over-running many military posts, inflicting a huge defeat on the Spanish known as the Disaster of Annual (1921), and forcing them back to a narrow area along the coast. The Republic of the Rif was established, but after several years Spain began to reconquer territory, and when Rifian forces attacked outposts in the neighbouring French protectorate (1925), French forces intervened and forced the surrender of Krim, ending Rifian independence, although occasional guerrilla action continued for several more years. The Rifians had no cavalry, so although this set is entitled ‘foot’ rebels, there was no other kind. The Rif state had a very small core of regular soldiers, estimated as no more than 7,000 at the time, but in fact probably never exceeding 3,000. Most of their forces were made up of tribal militia, men who fought for a specified period and then returned home. These men wore ordinary clothes rather than any uniform, and that meant the djellaba, which is a long outer robe with full sleeves and a hood. On the head was worn a small cap or a small turban, the style of the latter varying between the tribes, and sandals on the feet. We were therefore very surprised to find that not one figure in this set is wearing a djellaba since none have any form of a hood (while there are djellabas without a hood, they are few). We were even more surprised to find many of these figures wearing the Arab keffiyeh or shemagh. The Rifs are Berbers, not Arabs, and did not dress like Arabs, so basically not one figure in this set looks at all like any Rif warrior. After that bombshell, is there any hope for this set? Well possibly, because the Rif were not alone in their fight with the outsiders. As the Spanish were expelled, the Rif gained the active support of many of the Jebala tribes, who lived in the western part of the area while the Rifs lived in the central and eastern area. The Jebala were Arab, and so might in theory have worn a costume more like that of the Arab comrades in the Eastern Mediterranean. However we are still very doubtful of that, and have not been able to find out any information of the dress of the Jebala at this period, so this must only be speculation on our part. The Rif did purchase some weapons in Europe, or were given them by European sympathisers, but most of their arsenal was made up of captures from the Spanish (and late on, the French). Such captures were in large numbers, and included not only modern rifles but also machine guns, grenades and many artillery pieces, all of which were used. So their weapons were modern and ammunition was plentiful, but they did have a wide array of different models. The majority of their rifles were Mausers and Lebels, but unfortunately the rifles modelled here are largely undetailed so no identification is possible, although more than one general shape is apparent. No one has any visible grenades, but there is one machine gun – a Lewis. While we could find no confirmation of the presence of Lewis guns in the Rif, the French certainly used this weapon at this time, and it was also used during the Spanish Civil War in the following decade, so perhaps it did also reach Morocco in the 1920s. Curved swords, daggers and revolvers are much in evidence, which is good, so as far as we can tell there are no problems with the weaponry on display. Equally some of the men have visible bandoliers of ammunition round the waist of trunk, which makes perfect sense. As at the time of writing this is the first and only set for this subject, so it is pleasing to see a very broad range of poses on offer. Almost all are riflemen, which is correct, and they are in the usual assortment of poses appropriate to any nationality handling this weapon. Since the Rif is generally broken and mountainous terrain, cover is not hard to find, so we do not see any poses prone or otherwise cowering, which is good. The Rif were well known for finishing off their opponents either with the blade or by clubbing them with the rifle, so the two clubbing poses in the third row are especially appropriate. Again the mountainous terrain means the rifleman in the same row aiming down works perfectly, but we were worried a little by the Lewis gunner. He is obviously not actually firing the weapon from the hip, yet his stance seems to suggest that he is. He cannot be because, while the act is possible and was done, he is pressing the gun close to his body, so the magazine could not rotate (indeed half of this disappears into his body entirely). Also he holds the barrel by the metal cooling shroud, which quickly got too hot to touch, never mind grip like this, without protection. The single-piece poses are very enjoyable, with nice expressive gestures. We could find no evidence for the drummer, but have no reason to doubt the pose, and the flag-bearer, with his crescent-topped staff, is very natural. 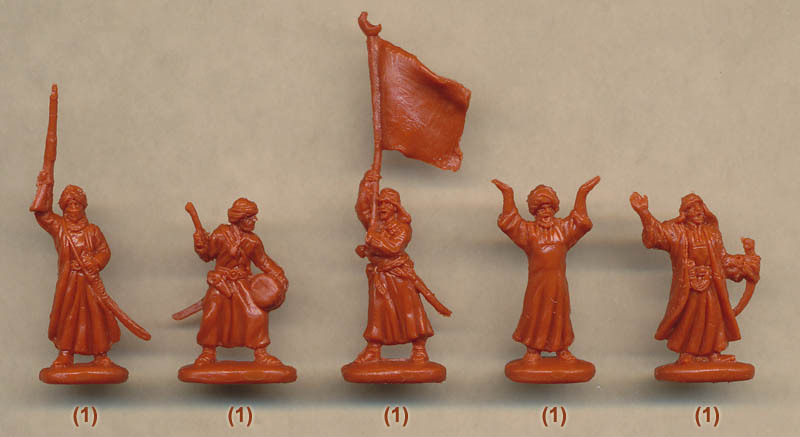 We are assuming the figure with both hands in the air is an imam, but not necessarily so, and we also assume the last figure is some form of commander, but like the men he looks far too Arab to be a Rifian. Aside from the Lewis gunner, we liked all the poses, and appreciated the good number on offer here. Nicely done and appropriate to the subject. The sculpting is reasonable, but as we have already said the weapons are largely lacking detail, although happily most of the costume makes no great demands for detail anyway. The Lewis gun has some detail, but lacks the bipod it should have, and while it is of roughly the proper length here it has been sculpted much too thick, giving it an ugly look which the real thing does not have. The faces with their large beards are particularly expressive, and generally the folds in the clothing look good. Proportions are fine, and the poses are natural and well balanced. Although the figures have a slightly rough feel to them, we found no flash to speak of, so they are well produced. The plentiful range of generally very appropriate and nicely energetic poses is a high point of this set, and the sculpting is quite fair too. However the complete absence of the traditional Berber costume, and the inclusion of various Arab elements, largely condemns this set right from the start. 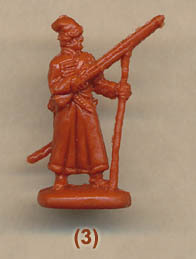 Strelets say this set was originally going to be more Arabs for their Arab revolt range, but was renamed later. Unfortunately the figures are not useful for the new subject, making this a surprising strategy. Since no one has previously made a set of Rif, those looking to recreate this particular colonial campaign have nowhere else to turn, yet this set fails to provide even the basic level of accuracy that might make it useful to even some of the more tolerant customers.